Thinning young seedlings is required after sowing new plants. Once the seeds have sprouted, it is time to give them space to develop. Here’s how to practice thinning efficiently. Thinning out seedlings is a technical procedure that gardeners practice regularly. The idea is to eliminate extra plants to make room for others (ones that will be able to flourish properly). Shortly after planting your seeds in a line, they will have germinated. 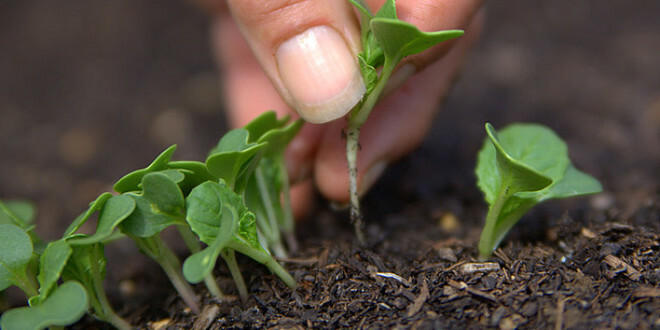 The seedlings can already be developing and carry a few small leaves. These are usually grouped tightly to each other. It is therefore necessary to remove some to favor the best. Eliminate the ones that are the least well-placed and the most stunted ones, while respecting a correct distance for your vegetable. It is often expressed in relation to fingers (about an inch): one finger between radishes, two between carrots, three between turnips and beets, and a hand (about 4 inches) between salads. There are three scenarios, depending on the type of vegetable and state of its development. First case, and the simplest: the vegetable seedling is small, inedible, and cannot bear transplanting. In this case, compost it, or coarsely chop it by hand and leave it there. Second scenario: the seedling can be replanted. When it comes to beets for example, young thinned seedlings are transplanted elsewhere, on a second line further down. Third case: the vegetable is consumable, like carrots, radishes or spinach. The vegetable is young, crisp, and delicious. When seedlings need to be separated, they are often very fragile and accidents do occur. Avoid separating them all at once. If you have between two plants about six seedlings to remove, to keep with a distance of 6 inches, do only remove two or three to start off. The remaining 3-4 can easily become consumable within a couple of weeks. In the end, you’ll only keep the most beautiful plants.